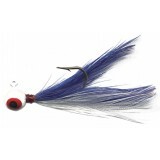 Feather Jigs are available in individual, 2-pack, and 12-cards. 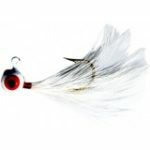 Nothead Tackle Hand-tied Feather Jig — Black Leadhead/Black & White Feather. Nothead Tackle Hand-tied Feather Jig — White Leadhead/Blue & White Feather. 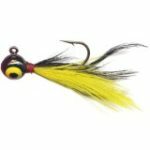 Nothead Tackle Hand-tied Feather Jig — Black Leadhead/Black & Yellow Feather. 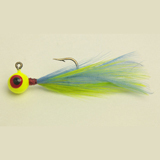 Nothead Tackle Hand-tied Feather Jig — Chartreuse Leadhead/Chartreuse & Blue Feather. Nothead Tackle Hand-tied Feather Jig — Chartreuse Leadhead/Chartreuse & Orange Feather. 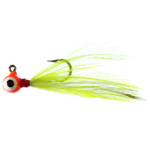 Nothead Tackle Hand-tied Feather Jig — Chartreuse Leadhead/Chartreuse & Black Feather. 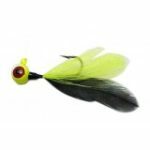 Nothead Tackle Hand-tied Feather Jig — Glow Leadhead/ Chartreuse & White Feather. Nothead Tackle Hand-tied Feather Jig — Blue Leadhead/Gray & White Tail​. 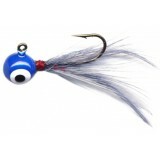 Blue Head and Gray/White Feather. 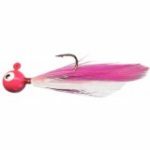 Nothead Tackle Hand-tied Feather Jig — Pink Leadhead/Pink & White Feather. 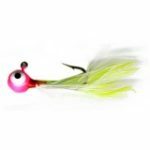 Nothead Tackle Hand-tied Feather Jig — White Leadhead/White Feather. Nothead Tackle Hand-tied Feather Jig — Pink Leadhead/ Chartreuse & White Feather. 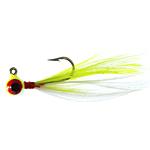 Nothead Tackle Hand-tied Feather Jig — Chartreuse Leadhead/ Chartreuse & White Feather. 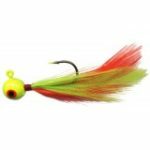 Nothead Tackle Hand-tied Feather Jig — Orange Leadhead/ Chartreuse Feather.